Are you as excited about this week as I am? Cuz I'm gonna go on vacation this weekend! Yippee!!! I've been wanting to cut with this die for months now... EEK!! I'm just gonna say it -- I LOOVE how my card turned out! Oh YES!!! Oh noooo... I made 2 of them!!! Beautiful cards!! Have fun on your vacation! Beautiful cards, I love the die you used and how you created the background! The colors pop against the black background! Absolutely gorgeous cards! I love how the colors pop thru the die cut design. Have a quick week so you can have a fabulous trip! These are so pretty! I love your color combo and such bright colors!! Fun design my friend! I am so excited for you to have some vacation time! I always look forward to a little R&R! Enjoy my friend, it is well deserved! Oh WOW, these look AMAZING! I love the colours you chose for the background, the vellum, the sentiment, all of it! Awesome cards! WOW These are gorgeous!!!! Gorgeous background die! Love the colors you chose Theresa! Have a wonderful vacation my friend!!! A couple more weeks for Spring break for me, but have fun on yours! These are gorgeous, Theresa! I love how the black makes the underlying colors pop. Looks beautiful. Enjoy your vacation!! This isn't so pretty!!! I love the colors!! WOW These cards are beautiful!! I love the gorgeous colors!!!! Have a great day. Love those cards, they are gorgeous!! I hope you have the best vacation ever! Relax and enjoy. I am slowly getting my craft room back together and I'm excited to start using it. Lovely! The black flower panel is awesome over your pretty distress inks. Wishing you a fabulous vacation! These are absolutely gorgeous! I love the bright colors peeking out from under that punch of black! Love, love, love these! I hope you have a fabulous vacation - enjoy yourself! 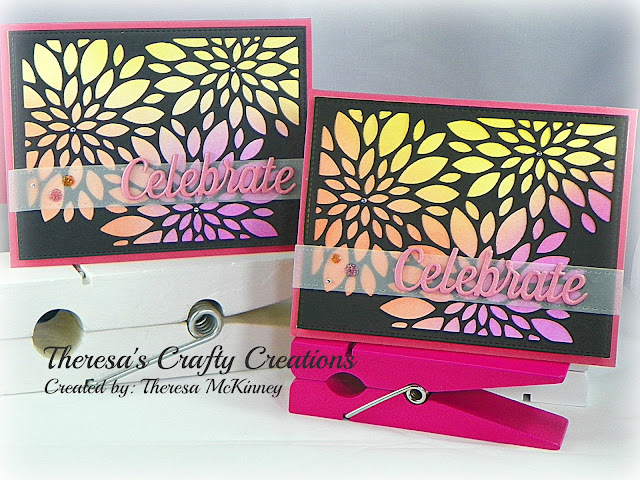 Distress inks are so much fun and looking at your beautiful cards makes me want to break mine out and play! I absolutely LOVE these! So fun, bright and cheery!!! WOW!! They are absolutely Gorgeous!! Ooh! i love this! That is a fantastic die and this card is beautiful! Very pretty! I need to get some vellum...not sure if I have any in my stash. I want to go look now. I love this die, and your cards are just gorgeous with the background of Distress Ink!! Your cards look amazing! You have such a talent for blending colours! Gorgeous!